Facebook Home: The Facebook phone is not as dumb as I thought it was going to be. The Facebook phone is not as dumb as I thought it was going to be. People have been waiting for the Facebook Phone for years. Not real people, mind you, just technology reporters. Since at least 2009, we’ve seen rumors, leaks, and scoops about Facebook’s on-again, off-again efforts to build a device meant to rival Apple and Google’s smartphones. No one ever quite articulated why this would be a good idea either for Facebook or for its hordes of users. If Facebook built its own phone, the company could expect to sell, at most, a few million of them a year—not that many, considering that its social network already claims a billion members. Also, who wants a Facebook phone? What would that even mean? Anybody who wants Facebook on his phone can already get it—the company’s apps and mobile site are hugely popular, and buttons to share stuff on Facebook are built into most mobile phones, including the iPhone. Why should Facebook go to the trouble of building its own phones when phone makers have already done that hard work for them? That appears to be the thinking behind Facebook Home, the big thing Facebook unveiled on Thursday morning. I choose that term—“thing”—very carefully. Facebook Home isn’t a phone, it isn’t an operating system, and it isn’t an app. Instead, it’s a free-to-download lock- and home-screen replacement for Android phones. If most people’s phones are already Facebook phones, Facebook Home makes them Facebookier, bringing the social-network’s content (including, at some point, ads), to your phone’s foremost screen. By riding in on Google’s Android app store, Facebook Home is a brilliant bit of jujitsu—it uses Android’s “openness,” Google’s chief selling point for its phone OS, to turn Google phones into Facebook phones. But if Facebook’s strategy works—that is, if millions of people install it and Facebook-ified home screens become a selling point for Android—the move might be even worse news for Apple. To understand Facebook Home, go to your smartphone and turn it on. You’ll see a screen that displays a clock, some alerts from your apps, and an unlock slider. That’s known as the “lock screen.” Then, when you unlock your phone, you’re presented with the “home screen”—the interface that shows off all your apps. If you install Facebook Home, both those screens will immediately be replaced by Facebook’s new interface. After that, every time you turn on your phone you’ll see a feed of photos and updates from your friends. You can flip through the pictures, Like them, and even comment on things without ever unlocking your device. To get to your apps, you’ve got to tap a little bubble to bring up a new menu. Facebook Home inserts itself between you and every non-Facebook thing you might want to do with your phone. The effect is one of parasitic invasion: In the past, your Android phone did everything, including Facebook. Now it’s a Facebook machine first. After a few taps, you might get it to do other things, too. Mark Zuckerberg put an optimistic spin on the shift during Thursday’s Facebook press event. Until now, he argued, interfaces for computers and phones have always been built around applications. Any time you want to do something on your machine, you click or tap an app first. But Zuckerberg thinks that’s an outdated way of navigating through computers, especially devices like phones which are designed for communication. “What if we flipped that around and made it so that our phones are designed around people first, and then you could also interact with apps when you wanted to?” Zuckerberg asked. I know what you’re thinking: I don’t want Facebook to take over my phone! I like apps! This is super terrible! What the heck is this world coming to?! Yes, yes, I feel the same way. But I’m a thirtysomething fellow who writes for a living and you’re the kind of person who reads essays about technology; in other words, you and I are probably too old and stodgy for this anyway. But there are tens or hundreds of millions of people around the world who spend many hours a day on Facebook. In fact, according to the company’s stats, Facebook accounts for almost a quarter of the time people spend on smartphones. What’s more, a lot of those people are using terrible Android phones—phones sold at bargain-basement prices, whose manufacturers slapped on ugly user-interface “skins” that make the devices difficult to use. For those Facebook addicts, Facebook Home could well be an improvement. I used the system for a while at Facebook’s demo area, and I didn’t find it to be such a terrible development for the world. Facebook Home is very pretty and responsive—it’s better looking, actually, than the standard iOS and Android home and lock screens. I also really liked an intuitive feature that Facebook (stupidly) calls Chat Heads: When you receive a message from a friend, his face pops up on your screen in a little bubble; when you tap it, you get a reply window superimposed over the app you’re currently using. This means that you can respond to a text while you’re reading a news article, without ever having to tap out of the news-reading app—it’s the slickest implementation of messaging that I’ve seen on any phone. I still don’t think Facebook Home is for me. I really don’t use Facebook very much at all. But after playing with it for a bit, I came away convinced that Facebook addicts should install Home on their phones. On April 12, Facebook Home will be available as a free download through Google’s Play Store, and at first it will work only on a handful on Android phones. (It will also come pre-installed on a mid-range smartphone, the HTC First, which will sell for $99.) 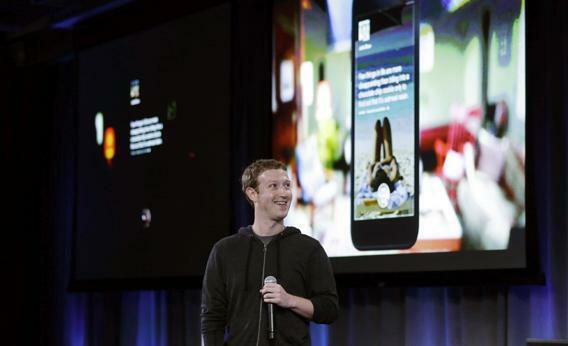 Soon, though, Facebook plans to make it compatible with the full range of Android devices, including tablets. Facebook can do this because of the way Google designed Android. The OS is extremely flexible—Google allows phone makers and outside developers to tinker with every part of the system. Android’s openness is central to Google’s Android strategy; Google gives away Android to phone makers for free in an effort to boost worldwide adoption. In the long run, Google hopes to make money off the OS through ads it displays on all those devices. But Android’s openness creates a free-rider risk. Google’s rivals can take Android and adapt it for their own ends. That’s exactly what Amazon did with its Kindle Fire tablets—those devices run a modified version of Android that gives Amazon’s services, not Google’s, pride of place on the device. But Facebook Home doesn’t go that far. The system does nothing to change most of the standard apps you use on your phone—your email, Web browser, search engine and pretty much everything else remain the same, which means they’re all still Google services. So while it’s true that Facebook Home will help the social network take over Android phones, that could ultimately be good for Google if it ends up bringing more users to Android. Apple, on the other hand, can’t be happy about this news. Now its three biggest rivals—Google, Facebook, and Amazon—are all spending the bulk of their mobile development effort on Android, not iOS. If I were Tim Cook, I’d be especially worried that Facebook might solve one of Android’s biggest problems—its “fragmented” ecosystem, in which every Android phone looks and works a little differently (and usually, not very well). This has long been a chief selling point for Apple: If you learn to use an iPhone once, you’ve learned to use it forever—all other models will always work more or less the same way. Now Facebook could ruin that advantage. By investing a lot of resources to create an inviting, well-designed UI that works the same across all Android devices, Facebook could turn Android into a system that’s as easy to use as the iPhone. So, sure, Google can’t be happy about Facebook stealing its phone’s front screen, but Apple is today’s biggest loser.